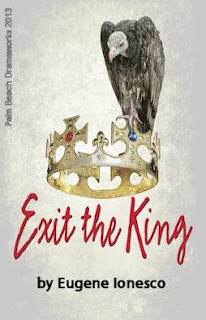 Palm Beach Dramaworks opened its production of Ionesco's Exit The King on March 29, 2013. An incompetent, 400-year-old king has just 90 minutes to live, but refuses to be convinced of his imminent demise or cede control in this absurdist comic romp. William Hayes and Lynette Barkley directed a cast that included Jim Ballard, Claire Brownell, Elizabeth Dimon, Rob Donohoe, Colin McPhillamy, and Angie Radosh. Professional productions of absurdist plays are not quite as rare as snow in South Florida, but they’re pretty scarce. Palm Beach Dramaworks put together a highly praised production of Eugene Ionesco’s The Chairs in 2008, and now it has returned to the work of that masterful playwright with Exit the King. McPhillamy, whose Berenger roams the audience telling hoary jokes before the show begins, is complex and brilliant as a man who refuses to accept his inevitable end. His loss of power and reason are funny, then unsettling. Radosh brings imperiousness and compassion to Marguerite, two qualities that are beyond Brownell’s Marie, a woman who is as childlike as her much older husband. Donohoe, Elizabeth Dimon’s bustling maid-nurse and Jim Ballard’s goofy guard deliver deft performances that underscore the production’s tone. Perhaps theater of the absurd isn’t done often in South Florida because artistic directors are afraid there’s scant appetite for it. But in staging this accessible Ionesco play, Hayes and Dramaworks have given theater fans yet another invaluable chance to watch the wondrous McPhillamy work his magic. Early on... as he shows us the little king for the bumbling Everyman he is, McPhillamy is only moderately amusing. It is when his curly carrot top turns white with age and fright that the actor comes into his own, with a towering performance that is profoundly touching. Whether or not director William Hayes consciously pulled back on the comedy in favor of the pathos, that is the result, and it is extremely effective. Supporting players Elizabeth Dimon, as Berenger’s nurse, and Rob Donohoe as his doctor, scurry about, adding choice bits of comic business. So does Jim Ballard as the palace guard, though his armor cuts down on the scurrying. Playwright Eugene Ionesco said he intended the play to be an apprenticeship in dying, and that’s an uncomfortable lesson to impart. Still, the show, as interpreted by director William Hayes, exerts a ghoulish fascination, and the truth of its message — don’t squander your life — is undeniable. In an unabashed performance, McPhillamy exposes Berenger as an overgrown baby. Alternately, in one of the show’s many hairpin mood swings, he achieves almost Shakespearean heights when Berenger roams the aisles imploring the dead to advise him. Brownell’s Marie is delectably childish. Radosh’s Marguerite surprises, developing unexpected compassion late in the show when she guides Berenger to his end. Skillful use of lighting, special effects and sound dramatize the end-of-the-world setting. Claire Brownell as Queen Marie, in her Alice-in-Wonderland inspired garb, amps up the hysterics of the vapid trophy wife to hilarious comic effect, while Rob Donohoe's crazy Doctor delivers the icing on the cake in the absurd humor department. Ballard's earnest telling of the King's accomplishments, from being the real author of Shakespeare's work to the inventor of the iPad (a modern tip obviously not written in the original script), is believably poignant. The true star of the show, as well he needs to be, is McPhillamy, whose King Berenger is astonishingly layered. By the time the curtain falls, you're as rung out as McPhillamy; his mastery of creating an emotional rollercoaster is well worth the ride. All in all, it is wholly satisfying to see challenging work rise to the top. This Exit the King reigns supreme. The word hilarious rarely applies to a bleak unblinking play about mortality, but Palm Beach Dramawork s superb production of Eugene Ionesco s Exit The King earns it, along with profoundly thought-provoking and other accolades. Simply, it ranks among the best work that the company has mounted in its 13 seasons. Part Marx Brothers, part Existentialism, this reimagining of Ionesco s most accessible and linear absurdist play includes two tour de force performances by Colin McPhillamy and Angie Radosh, and endlessly inventive direction by William Hayes with Lynette Barkley. For the first half of the play, Hayes and company thread a playful, wacky vibe that embraces physical comedy, likely hundreds of humorous touches and such farcical set pieces as characters chasing each other under a strobe light like the flickering images of a Keystone Kops short. This is as daffy a tone as Dramaworks has ever attempted and it fully succeeds. ...then an amazing transformation of tone occurs in the final scene a stunning combination of brilliant acting, writing and direction worth the entire evening. Berenger has physically been slipping into an inert state, but his mind and spirit refuse to succumb. In the performance that will stick with you long after the house lights come up, Radosh gently and with inestimable compassion for a flawed and frightened being, she guides Berenger s passage from life to death. Praising Radosh whose regal imperiousness and disapproval for her husband turns into such care, is actually backing into a crucial facet of this success: McPhillamy. McPhillamy creates a baggy pants clown whose bottomless bag of broad vaudevillian tricks makes palatable a king who is unredeemably selfish, self-centered, ineffectual, childish, petulant, even downright nasty a Sears catalogue of human failings. With befuddled squinty eyes, gaping mouth and elastic body language reminiscent of Buster Keaton and Charlie Chaplin, McPhillamy conjures an Everyman who has undeservedly stumbled into the benefits of being king without accepting any of the responsibility. The supporting cast is uniformly fine and each gets their own spotlit scene. A favorite has to be Ballard s stenatorian guard who takes an introspective moment to admiringly enumerate the very long list of Berenger s accomplishments, which range from inventing the wheelbarrow to being the real author of Shakespeare s works. In a year in which there already has been an embarrassing wealth of don t-miss productions such as Other Desert Cities, All New People, In The Heights, Lungs and Sideshow, this one soars to close to the top of the list. When the show commences, it opens with the lightness of a game show, as multicolored spotlights wend around the stage to introduce the characters, dressed in ludicrous period garb from no particular period. ...there are obvious comic devices, mostly inserted by Rush and Armfeld in misguided attempts to inject levity into the proceedings. Ballard's guard has an annoying tendency to sing lines of dialogue like they're famous rock lyrics... McPhillamy engages in some exaggerated, silent-film-style mugging, but it doesn't suit him nearly as much as the show's dramatic core. I'm not alone here — aside from a few isolated pockets of nervous chuckles, the response that accompanied most attempted quips on opening night was that of the proverbial cricket. I'm not sure if the show's absence of comic potency is a flaw in William Hayes' direction, but it ultimately doesn't matter, because as a drama, this production is masterful. For all his characters' impotent laugh lines, McPhillamy's performance is more rooted in Kübler-Ross' five stages of grief, touching all of them over the course of the show. McPhillamy is backed by a perfect ensemble, with Dimon, Donahoe, Ballard, and Brownell offering flawless support. It's Radosh, though, who deserves singling out... We've seen Radosh surprise us again and again on the South Florida stage, and this remarkable turn is another revelation. It's not often that a 100-minute play feels like a goddamned eternity — and it's even less often that such a statement is presented as praise rather than criticism. Despite its comedic veneer, if you're enjoying yourself too much, you're not really getting it.